I have been attempting to work through my Unfinished pile as well as create a few new items before I start on my winter wardrobe. 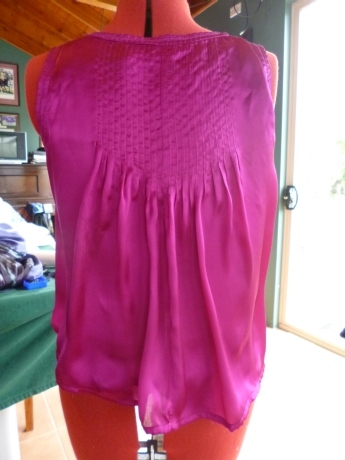 One item I have been avoiding for a while was a silk top I had bought a few years back , it was originally a tunic style. Seen here my attempt to show how it originally looked . It was a little too much for me I loved the fabric and color but I wanted a short top and had some leftover once I had cut it. I had avoided hemming it for a few years just couldn’t be happy with my attempts. The hem of the top I have finally finished after I got the step by step details from a wonderful blog here and I am really happy with it. The excess fabric and lining I used a couple of years ago to make a evening shawl type garment. My husband and I were invited to a Pink Ball and as I at that point didn’t own any pink evening wear ,I used the leftover fabric to make this. I am really happy with this combination of garments the silk is gorgeous. 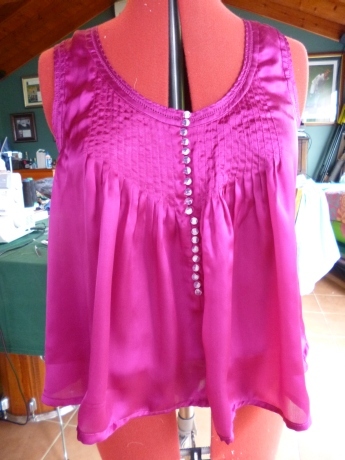 I have now one less unfinished garment so can move on to completing the next in the pile. It is very satisfying when something works. I know we all have things that don’t work or that make us remake or change but that is all part of the process of creating the things you want for yourself. The more I do, the more I learn and I am loving it. The wonderful world of the online sewing community makes the answers to questions not hard to find , there is always someone who can assist with techniques and generously sharing knowledge, it is wonderful . This entry was posted in inspiration and tagged Restyle. Bookmark the permalink.